We get no broadcast, cable or satellite television at my homestead. Being in a cut-off cove in a sheltered depression on the southeastern slope of Mount Mitchell and smack up against the Blue Ridge continental divide (less than 5 miles uphill to the west), the “public airwaves” don’t reach us. Cable is never going to come half a mile up our driveway just so we can watch the SciFi channel, and satellite package deals are well out of our budgetary range. What we do have is a combo VCR/DVD player and 20 years’ worth of accumulated movies, PBS/BBC special series collections, etc. We go for weeks without actually watching, but when the family’s here or during those dark months when we can’t be working or playing outdoors, we indulge frequently. One of my all-time favorites to view again and again is the 2-volume VCR version of Kevin Costner’s Dances With Wolves. And I am not alone among my female family members and friends in never tiring of enjoying the stunning physical presence in that movie of Native American actor Rodney A. Grant as the character “Wind In His Hair.” I want to make this connection between a contemporary fictional role model of the once fierce and free natives from whom our mostly British “founding fathers” stole this vast nation, and the technology that will play a lead role in this vast nation’s energy future: Wind. More and more of those towering 1.5 Mw land-based wind generators are dotting skylines across the country, primarily in the midsection’s Great Plains from the Canadian border to the Rio Grande’s separation of the U.S. from Mexico. As the generators are increasingly installed we’ve been hearing a lot of astroturfed complaints (those funded by the fossil fuels and nuclear industries but intended to look like ‘grassroots’ Mom & Pops). The windmills are ‘ugly’. They make too much noise. They can’t provide ‘baseload’ power when the wind’s not blowing. Etcetera, etcetera, etcetera. Old King Coal and the Nuclear Priesthood aren’t making all that much headway with their anti-wind and solar PR campaign, as homesteads, villages, towns and cities happily increase their reliance on renewables to power our energy future. Renewables don’t contribute hefty amounts of CO2 and particulate pollution that contributes to millions of human deaths annually and climate change that will kill millions more. There is no nasty waste product of generation that needs careful disposal and management (in the case of nuclear, for at least 10,000 years AFTER we’ve toasted our breakfast bagels), no chance of meltdowns or explosions that amount to the Mother Of All Dirty Bombs, no ever-increasing mercury poisoning, cancer rates and pollution-caused pulmonary dysfunctions, no imperialistic wars of aggression to be fought by our children to steal the natural resources of other people’s countries to enrich fossil fuelish greedheads. Wind and solar ‘spills’ will never cause whole swaths of valuable territory will never become “exclusion zones” unfit for human habitation for hundreds of years. And unless you happen to be standing next to a concentrated solar boiler when it overpressurizes, or directly under a wind tower when it falls, accidents aren’t at all likely to kill you. I heard this week about a very cool new offshore wind project (pictured above) planned to serve Megalopolis – the dense U.S. population zone between northern Virginia and New York – that is exciting. The Atlantic coast of North America enjoys a wide and stable offshore continental shelf that is only 50-150 feet deep, which allows offshore turbines to be well anchored. The west coast drops off steeply and is notorious as an earthquake zone, so offshore wind there is not as feasible with current technology. Though I’m sure appropriate technology will be developed soon to take advantage of Pacific winds to supplement what can be done with solar in the desert southwest and southern California. 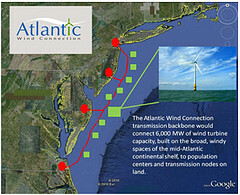 The Atlantic Wind Connection project for Megalopolis includes a series of 4 to 15 Megawatt wind turbines placed 15-18 miles offshore so they can’t be seen from the beaches and connected with a HVDC [High Voltage Direct Current] backbone grid and 4 feeds to the mainland along the route. HVDC is better for transmission of generated electricity over long distances on land or from generators offshore because it loses less of the power along the way. HVDC cables also generate virtually no electromagnetic fields, offer better flow control, minimize environmental impact, and have other advantages as well. As an additional plus for the project, researchers at the Lawrence Berkeley National Laboratory confirmed in late December of 2011 that wind power is now at $33 to $65 per megawatt-hour and still falling, positioning wind to quickly become the most cost-effective means of generating electricity. 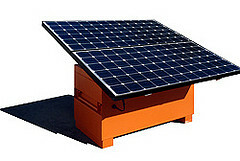 Even better, a nationally supported effort to manufacture, install and operate renewable energy systems holds great promise to provide literally millions of jobs at a time when unemployment levels have been far too high for far too long – a way to help get us out of this long economic depression and thrive in the future for having built the new infrastructure. There is of course no guarantee that this country’s political system is at all capable anymore of planning or doing for the future health, prosperity and security of the people. Rather, it’s obvious that there’s not a national politician of any Party or philosophy at any level of government right now with enough vision, courage or chutzpah to even try. Fortunately, there are corporations, financiers and investors willing to step into the breech and do what government won’t do. It will be up to us – We the People – to insist that our elected leaders do what is necessary to support and promote the necessary change-over from fossil fuels and dangerous nuclear power to renewables. And if they are too timid to take a stand, it’ll be up to us to replace them with people who will do the right thing. Toward that goal I will be posting more about the latest developments and deployments of renewables going forward, and providing information of particular interest to homesteaders who want to go off-grid or become suppliers themselves. Do stay tuned!